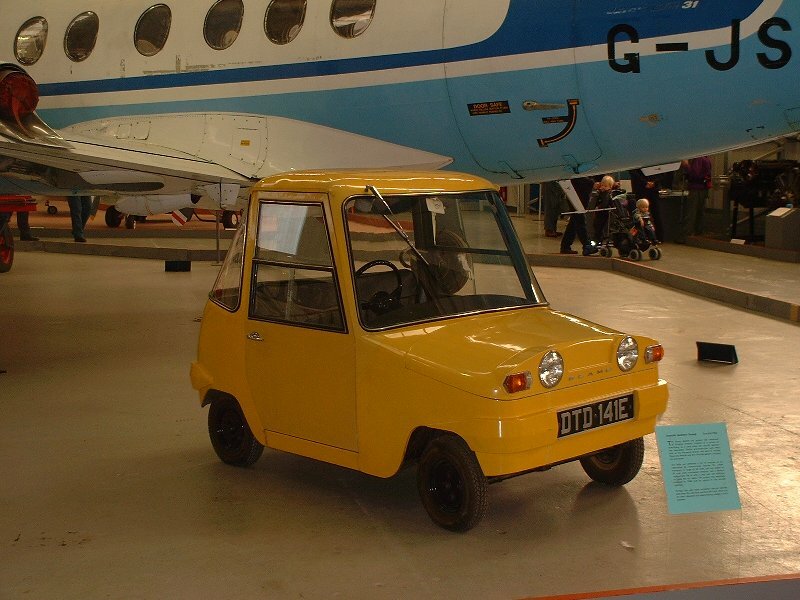 The Scottish Aviation Scamp was a small electric car developed and produced by Scottish Aviation Ltd at their Prestwick factory from 1965. Designed by Dr WG Watson, only 12 units are understood to have been produced, although the car was never commercially produced. The car was rear wheel drive, carried four 48 volt batteries and had two electric motors, believed to produce about 3 hp. The Scamp had a length 84 inches (2.13 m), and a width 46 inches (1.17 m). Finance for the project was provided by the Electricity Council, undertaken at a time when small cars were extremely popular, and was intended to be used by shoppers on short journeys. Although it had a claimed top speed of 35 mph, battery technology of the time meant the Scamp could only cover 20 miles between charges. Stirling Moss was brought in to publicise the car, but the Electricity Council required the car to undergo testing at the the Motor Industry Research Association (MIRA). During these tests, the car's suspension collapsed and the Electricity Council said that as a result the car was not roadworthy and not fit to appear in their showrooms. After the twelfth example was completed, they withdrew their funding for the project, and it was soon abandoned. Suggestions that the Scamp might be produced as "the commuter car of the seventies" were never to materialise. The construction was a simple fibreglass-over-ash bodied two seater, powered by twin series wound DC motors of 2 hp which powered the rear wheels through a chain drive. The first prototype was completed at Prestwick in 1965, but the car did not make public appearance until the Ideal Home Exhibition of 1967. Of the 12 cars believed to have been built in the pilot production run, two were retained by Scottish Aviation, while the remainder were delivered to the Electricity Council for test and evaluation. The yellow example is on display at the National Museum of Flight, East Fortune, while the red example can be found a few miles to the west, at the Myreton Motor Museum, Aberlady. When running in wet conditions the driver's floor became flooded to a depth of one inch. Water was swilling under the saturated seat cushion. In all conditions the driver complained that his knee was being bruised by the door handle and that the safety harness persistently slipped off his shoulders... After the speedometer had stopped working, the controller cut in and out at random until the car stopped altogether with a burning smell... The steering suddenly became dangerously indefinite... The rear compartment door flew open and the spare wheel fell out... On more than one occasion, the driver found it necessary to take evasive action when suddenly seeing an animate or inanimate object on the road surface; the steering characteristics were such that he was unable to cope with the resultant behavior of the vehicle. The one I wish to consider in detail, however, is the Scamp, 15, designed and made by Scottish Aviation Ltd under the direction of Dr W. G. Watson and his project leader, Mr J. Chalmers. Dr Watson initiated the design programme some two years ago because he felt that, for local use, present saloon cars require too much capital outlay and take up too much space, and that in the future increased affluence will lead to a demand for a second car, while social attitudes will lead to much stiffer legislation against fumes and noise. "What I wanted," he says, "was a quiet, fumeless, highly manoeuvrable and easily parkable car - and something that would undercut the Mini by, say, �150. In fact, the price I was aiming at - �330 to �350 - determined the brief." These considerations led Dr Watson to investigate the possibilities of an electrically powered car- "l was fairly convinced that an electric engine would give markedly improved mileage for the price of a gallon of petrol" -though it did mean that the car would be unquestionably a 'second car' in performance and range. The designers of the Scamp adopted a conventional layout for engine, controls, passenger space, etc. but only after many unconventional ideas-three-wheeled versions, a diamond shaped chassis, a body without doors, a la Ze-Ze, etc - had been tried out and rejected. The only unconventional thing about the Scamp is its motive power (four 48V batteries which supply two motors, one to drive each of the rear wheels through a chain drive), its size (the Scamp is 7 ft long, 3 ft 10 inches wide and has a turning circle of 16 ft 6 inches), and its performance. It has a maximum speed of about 35 mph, cruising speed of 30 mph and range of 15-25 miles, depending on conditions and the number of stops. Indeed, because the range is so limited, the Scamp is described as a 'known journey vehicle': only if it had a range of about 60 miles (which is what London taxis average a day) would the designers call it a 'town car'. Twelve Scamps are now being supplied to regional electricity boards for trials, and full production of the car is expected to begin early next year. The stumbling block of the Scamp, and other electric town cars, is its short range. The Electricity Council has tried to overcome this problem by fitting one of its Mini Travellers with a silicon controlled rectifier or Thrysistor control, which regulates the drain imposed on the batteries and allows a recharge to build up during braking. As a result, the Mini Traveller has a range of 36 8 miles when driven non-stop at an average speed of 30 mph, though the range drops to 16 miles if four stops per mile are introduced. The disadvantage of the Thrysistor control, however, is its cost (about �150 extra). In Dr Watson's view, the increased mileage could be gained (at little extra cost) if the batteries could be tapped systematically, so that they were all used evenly throughout a journey and without any one of them being called on for extra duty (eg, for starting, as happens if the batteries are linked in a series). The development of an integrated battery system of this kind is a problem for battery and contactor manufacturers; but there is no reason why it should not be solved in the reasonably near future. In the meantime, the problem of short range could be partly overcome by providing facilities for cars to be charged during the day - perhaps while standing at a parking bay. If this were done, a commuter could safely use his electric car for a journey of up to 15 miles each way. There is, however, another possible way out for the electriccar designer, and this is in the development of zinc air batteries and - eventually -fuel cells. The fuel cell is a kind of battery which, instead of needing to be recharged at regular intervals, is continuously fed with fuel, and although there are still problems of weight, volume and cost, some people, at least, believe they will be satisfactorily overcome. The companies at present working on fuel cells include General Electric Co, Pratt and Whitney, and Allis Chalmers in the States; Brown Boveri in Switzerland and Varta in Germany; and the Chloride Electric Co, Energy Conversion Ltd and Shell Research Ltd in Britain. A battery for the future? Finally, the zinc air battery. This is based on cells in which one of the conventional electrodes is replaced by an air electrode which reacts with oxygen. These cells have the advantage that the entire mass of reacting material need not be i initially charged into the cells, since fresh oxygen from the air is continuously brought to the air electrode by convection or fan, and thus, when an air cell is drained at a modest rate in the five-to eight-hour range, a large weight saving in batteries can be obtained. Compared with conventional batteries, the zinc air battery has a high energy potential which could give the Scamp, for example, a range of more than 60 miles for the same amount of battery space. "Once the zinc air battery becomes available," Dr Watson says, "then I really will have created a town car." - Design journal, July 1966. 2 ⇑ Richard Carr, In search of the town car, July 1, 1966. Design (Council of Industrial Design), Issue 211, pp: 29-37.